We have various coloring books so that Teddy can spend some time with his favorite characters. We travelled a lot and bought him coloring books of gladiators at Coliseum in Rome, soldiers at The War Museum in Paris and many other books. Teddy was not much into coloring since he prefers to draw and color his own creations until he had a chance to put his hand on Painting Lulu’s Paper-to-Digital Coloring Set. He was very excited to try this combination of paper book turning into digital using special coloring application. 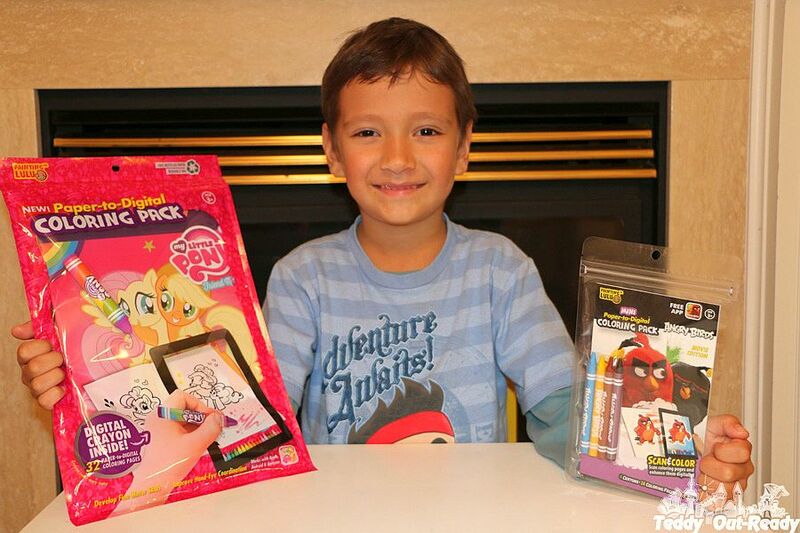 We received My Little Pony and small Angry Birds coloring sets for Teddy to try and see how it works. 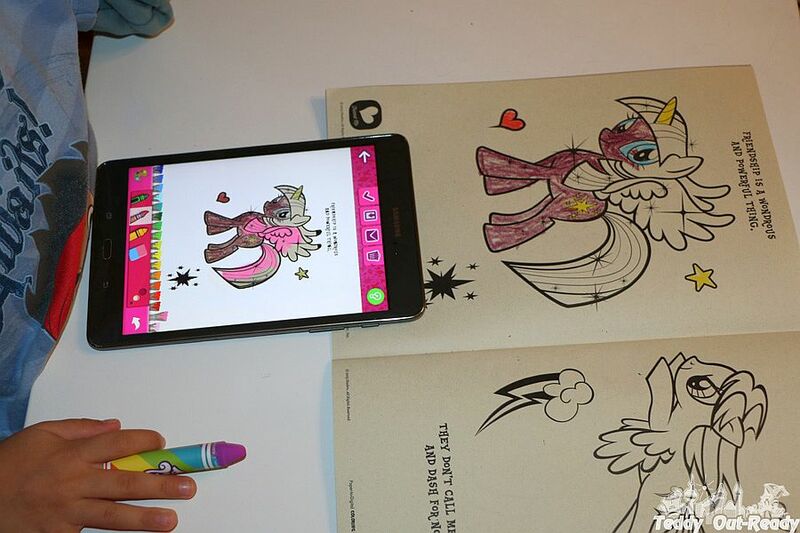 The first set included paper coloring book and a crayon stylus. The second one, Angry Bird included one mini coloring book and a set of regular crayons. Children can color their favorite characters on paper and then using Painting Lulu application scan their pictures and continue working on their creations adding extra colors, changing them or adding extra digital effects. Then they can save their pictures or e-mail them to family or friends. All those features available in the Painting Lulu app. 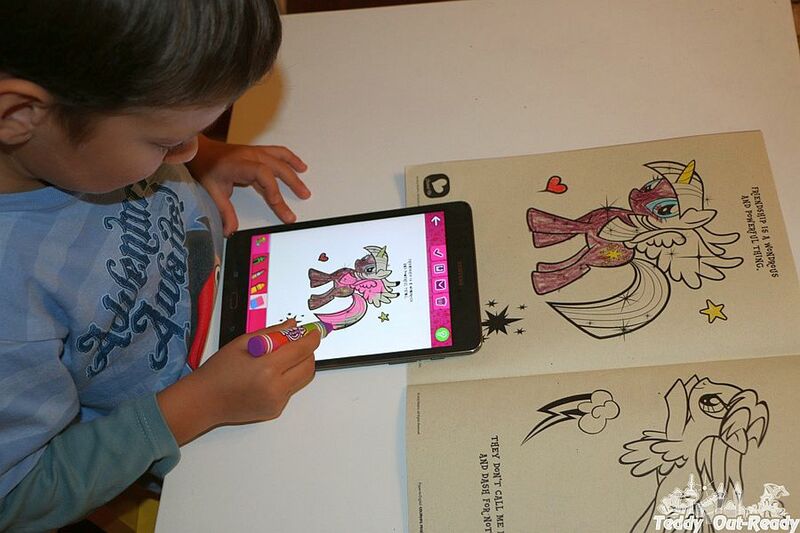 Teddy started with My Little Pony book coloring Twilight Sparkle and then he scanned it using his tablet and continued coloring it adding background color and extra digital effects. Teddy likes the abundance of colors he can choose in the digital app and the ability to play with the thickness of the stylus in the application when focusing on smaller parts or when coloring bigger ones. Right now more books featuring Barbie, Hot Wheels, Transformers Rescue Bots, Tonka, Angry Birds the Movie, Batman, Scooby-Doo and DC Super Friends are available for kids to enjoy paper-digital journey from Painting Lulu. Designed for children ages 3 and up, sets contains a paper coloring book, traditional crayons, a stylus, and a free coloring App Painting Lulu. All coloring sets include a code that unlocks the digital version inside the App. The app is available for Amazon, iOS, and Android devices. Now our boy has a wonderful set to apply his creativity along with coloring books. Teddy likes the option of creating selfies using his pictures. It is easy to go from real world to digital with just one button click. Using Painting Lulu, children can learn many things, from drawing skills to focusing and building their confidence. Right now Teddy invented a fun task to name all colors in French. For more information about amazing coloring sets, I am sure the themes and number of books continue to grow, check Painting Lulu web site.